Robert Burrowes’ book, The Strategy of Nonviolence Defense: A Gandhian Approach (2) is a major contribution to the field. It presents a closely argued and highly principled perspective. A full appreciation of the book requires considerable study. Here my aim is to outline some of its key ideas and comment on its value. In writing this commentary, I cannot pretend to be neutral. I have known Robert for quite a few years and gave him comments on a draft of his PhD thesis, on which his book is based. I admire his principled stands and leadership in promoting nonviolence in Australia and beyond. On the other hand, we do not agree on every point. Robert’s book canvasses a wide range of ideas, beginning with a critique of classical ideas about strategy and culminating in several chapters laying out the strategy of nonviolent defence. The central message of the book is encapsulated in a table on p. 209. It states that the political purpose of nonviolent defence is “to create the policy, process, structural, and systemic conditions that will satisfy human needs.” This is the general framework. Within this, there are two strategic aims, one each for the defence and for the counteroffensive. For the defence, the strategic aim is “to consolidate the power and will of the defending population to resist the aggression.” This includes mobilisation of “key social groups” including worker organisations, women’s groups, religious bodies and ethnic communities. This might sound deceptively easy but it has significant implications. For example, in choosing whether to hold mass rallies, the key thing is not how many people will attend, whether there will be media coverage, or whether police and troops are likely to use violence, but whether the action will strengthen the power and will of the population. Robert traces the consequences of his general framework through a range of areas, including the time frame of the struggle, communication with the opponent, selection of nonviolent tactics, secrecy, sabotage, maintaining nonviolent discipline and making defenders less vulnerable in the face of an extremely ruthless opponent. Parallel to the strategic aim of the defence is the strategic aim of the counteroffensive: “to alter the will of the opponent elite to conduct the aggression, and to undermine their power to do so.” This has three components. First is altering the will of the troops of the opponent elite. In the case of the Palestinian intifada, this would mean winning over Israeli troops or at least weakening their commitment to serve the repression. Throwing rocks at them is less likely to achieve this than engaging them in dialogue and demonstrating Palestinian commitment. The second component is altering “the will of key social groups who support the opponent elite’s act of aggression.” For the intifada to be effective, it was necessary to undermine support within Israel for the Israeli occupation. The third component is altering the will of allies of the opponent elite. For the intifada, this means challenging the support given to Israel by the US government. Robert’s formulation of the political purpose and strategic aims of nonviolent defence is built on some important theoretical innovations. The strategic aims deal with both power and will, of the defending population and the opponent elite. This is no trivial matter. To begin, only a few authors have dealt seriously with strategy for nonviolent defence. Anders Boserup and Andrew Mack, in their important book War Without Weapons, concluded that the strategic aim is maintaining the unity of the resistance. (3) Gene Keyes, on the other hand, decided that the strategic aim should be maintaining the morale of the resistance. (4) Working out the strategic aim is important since it should be the basis for designing campaigns, choosing tactics, building alliances and many other aspects of the defence system. Robert’s formulation has two components: will and power. This can be most easily understood in relation to the counteroffensive. One component of this is altering the commitment of opponent troops to their assigned tasks. If their commitment or “will” can be altered, then the opponent cannot succeed, except by bringing in other troops. But even if the troops remain committed to their tasks, they can be nonviolently coerced. This is the factor of “power.” For example, in the 1986 “people power” revolution in the Philippines, some soldiers were won over to the resistance by talking with people opposed to the dictatorship, undermining their will, whereas others were primarily influenced by the massive demonstration undermining their power. Another important theoretical innovation concerns the idea of “human needs.” It is built into the statement of the political purpose of nonviolent defence: “to create the policy, process, structural, and systemic conditions that will satisfy human needs.” Robert cites a number of theorists who argue that all humans have certain innate needs, such as for response, security, recognition and stimulation (to pick a few from one theorist). These needs may be modified by socialisation but cannot be eradicated. Denying fundamental human needs leads to social pathologies, including aggression and repression. The human needs perspective is a rejection of the idea of innate human evil or violence, which is used by elites to explain conflict (such as blaming Hitler for Nazism). Instead of this, human needs theory concludes that conflicts can be resolved by satisfying the needs of those involved. In other words, conflict is not inevitable, but is the outcome of inappropriate social structures that obstruct the satisfaction of human needs. Compared to other works dealing with the subject, The Strategy of Nonviolent Defence is distinctive in its sustained Gandhian approach. The most common approach in the field relies on a pragmatic conception of nonviolence, namely that nonviolent methods are more effective than violent methods. The Gandhian approach has been presented many times, of course, not least by Gandhi himself, but seldom applied to the strategic problems of defence. Gandhi’s approach included personal nonviolence as a way of life, constructive work and the use of nonviolence against direct and structural violence. His approach to conflict included a belief that means cannot be separated from ends (good goals do not justify bad methods), a belief in the unity of all life, and a willingness to suffer for one’s beliefs. Approaches to nonviolence can be divided along two axes: principled versus pragmatic and revolutionary versus reformist. Gandhi’s nonviolence was principled and revolutionary. Many other writers on nonviolent defence, such as Gene Sharp, are better described as pragmatic and reformist. They justify nonviolence on the basis of its consequences – the pragmatic approach – and they see nonviolent defence primarily as a way to defend society, as it exists, as the reformist approach. Robert strongly criticises non-Gandhian approaches. He criticises Sharp’s approach of civilian-based defence for being based on a faulty strategic theory (the indirect approach of Liddell Hart, subject of a critique earlier in the book), for relying on a conception of society oriented to elites, and for failing to focus on satisfying human needs. Robert’s approach is principled and revolutionary, and perhaps his sort of principled nonviolence is inevitably revolutionary. Although the title of the book uses the word “defence,” this is not national defence the way most people think of it. It is more akin to nonviolent revolution. While distinguishing his position from non-Gandhian nonviolence theorists, Robert also spends plenty of time challenging arguments for violence. His most caustic comments come when addressing the problem of severe repression: “Violence is grossly dysfunctional. For example, it cannot resolve conflict or satisfy human needs. And whenever it has been used in the service of major political goals, it has led to suffering and death, often on a massive scale. Critics of nonviolence often overlook these points – a reflection, in part, of the pervasiveness of an ideological perspective shaped by elites who benefit from the use of violence” (p. 239). So far I’ve tried to give an idea of the thrust of the book. It is impossible in a short article to give an outline of all its arguments. A flavour can be obtained by looking at a sampling of the topics covered in the chapters. The strategic theory of military strategist Carl von Clausewitz, including its serious limitations. Basil Liddell Hart’s views on strategy and other conceptions of strategy. Conceptions of society, covering a range of theories. Human nature and human needs. Conceptions of conflict and how to resolve them, including John Burton’s problem-solving approach. Theories of power, arguing for a modification of the consent theory of power to include structural theory. Approaches to nonviolence, especially Gandhi’s approach. A summary and codification of the key elements of theory presented in earlier chapters. Perspectives on security from feminism, indigenous peoples, the South and deep ecology. A summary of the strategic theory of nonviolent defence along with a critique of civilian-based defence. Planning and organising nonviolent defence, including strategic assessment, organisation, leadership, internal communications, advance preparations, constructive programme and evaluation. Strategy and tactics of nonviolent defence (as described earlier). The strategic counteroffensive (as described earlier). The origins of the book in a PhD thesis are apparent in its logical progression and surveys of the literature in the early chapters. These chapters cover areas that are intellectually important, such as Clausewitz’s conceptions of strategy, and will be of interest to those who want to savour all the thinking that lies behind nonviolence defence strategy. The early chapters serve the purpose of clearing the intellectual ground, by summarising important areas of thinking and showing their value and, more commonly, limitations for the purpose of developing a Gandhian approach to nonviolent defence. These chapters are written quite clearly. Nevertheless, many readers may want to skip the preliminaries and go straight to the guts of the book. Chapter 8 gives a convenient summary of previous chapters, and it would be possible to go on from there. Alternatively, one could start with chapter 10 or 11 and then, if desired, go back to earlier chapters. I found the later chapters more engaging partly because they are more practical and partly because they give more examples from nonviolent struggles such as Gandhi’s campaigns, the intifada, the Chinese pro-democracy movement, and struggles in South Africa and Burma. The Strategy of Nonviolence Defense is impressive, but it does not answer all questions. For example, in chapter 7 on the Gandhian conception of nonviolence, Robert criticises the pragmatic and reformist approaches. His argument seems to be that the pragmatic approach is less effective than the Gandhian approach, for example when he says that “recent psychological studies indicate that Gandhi’s conception of nonviolence is likely, from the opponent’s perspective, to generate the minimum degree of psychological resistance and to increase the rationality of seeking creative outcomes” (p. 115). The implication in this section is that principled nonviolence is more effective in the long term. Robert never clearly spells out criteria for comparing approaches to nonviolence. Is long-term effectiveness a criterion? Should principled nonviolence be used even if less effective in the long term? Or does a pragmatic approach which takes into account human needs and the long term become equivalent to a principled approach? Robert mostly gives abstract statements about Gandhi’s approach and thus his discussion is too general to work out clear-cut answers to such questions. Along the same lines, Robert makes a distinction between the Gandhian view of the unity of ends and means and the non-Gandhian view that ends and means are separated. But is this distinction really so crisp? Surely in most cases the means influence the ends but do not determine them. What are the conditions and implications of linkages between means and ends? The human needs perspective begins to look shaky when it becomes necessary to talk of numerous “distorting” factors that obstruct satisfying the human needs of an opponent. For example, as Robert notes, members of the Israeli government may have a distorted view of their own needs due to propaganda, religion, ideology, role defence and culture, and their behaviour may be influenced by things such as non-rational emotions and perceptions that are distorted in various ways (p. 248). If biological “needs” can be socially “distorted” in so many ways, then it may be more useful to focus on the social construction of needs. If some human needs are mainly or entirely socially constructed, Robert’s strategic theory is still relevant. As well as attempting to alter the opponent’s will by satisfying needs, another option would be to transform those needs or, in other words, to socially construct them in a different fashion. This opens up a further terrain for nonviolent struggle. 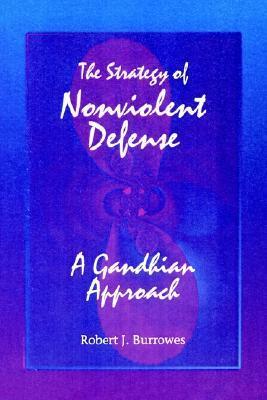 The Strategy of Nonviolence Defense lays out the elements of a Gandhian approach to strategy. For those who subscribe to a Gandhian approach and who are concerned about nonviolent defence, this is the place to develop one’s understanding of strategy. But there is one important thing missing. The book says little about the practical task of building a movement to bring about nonviolent defence. It is more in the nature of an advanced text for leaders in a nonviolent defence system, who are concerned about planning, education, communication, tactics and the like. But at the moment there are relatively few groups around the world even interested in nonviolent defence. How are they to build widespread support for it? How can they foster commitment to the nonviolent discipline that is necessary for success? In particular, how can activists get others to support nonviolent defence and a Gandhian perspective in particular? The few pages of the conclusion to the book give some hints about making the change to nonviolent defence. Robert says an appeal to elites will not work and that a suitable approach will include local nonviolent campaigns, building of nonviolent communities, reflecting on and learning from experiences, nonviolence education, nonviolence networks and personal change. But he elaborates only on personal change. There is little guidance for action at the level of groups. So here is a substantial book giving guidance for how to run nonviolent defence against aggression, sitting on shelves waiting to be read. Two things are needed to bring it off the shelves and into active use. The first is a major constituency for nonviolent defence, as just described. The second is more accessible, popular, easy-to-read, digestible treatments. Robert writes clearly but nevertheless many nonviolent activists will find the book heavy-going. A good way to deal with this difficulty is for groups to read and discuss the book, relating it to their own experiences and plans. One section or chapter could be dealt with at a time, perhaps starting with later chapters. This approach to the book is quite compatible with its theme. Strategic insights need to be collectively developed and applied. It is no use relying on one or two individuals to give directions on a campaign. A successful nonviolent defence must be built on widespread commitment, and this should include a practical grasp of strategy and the principles and reasoning behind it. Groups of activists are in the best position to “translate” theory into something that has popular appeal and meaning in people’s lives. That is surely part of a Gandhian approach to nonviolent defence strategy. I wish to thank Roland Bleiker, Mary Heath, Ralph Summy and Tom Weber for helpful comments on a draft. A shorter version of this review appears in the May/June 1997 issue of Gandhi Marg. (1) Key works include Anders Boserup and Andrew Mack, War Without Weapons: Non-violence in National Defence, London: Frances Pinter, 1974; Gustaaf Geeraerts (editor), Possibilities of Civilian Defence in Western Europe, Amsterdam: Swets and Zeitlinger, 1977; Stephen King-Hall, Defence in the Nuclear Age, London: Victor Gollancz, 1958; Michael Randle, Civil Resistance, London: Fontana, 1994; Adam Roberts (editor), The Strategy of Civilian Defence: Non-violent Resistance to Aggression, London: Faber and Faber, 1967; Gene Sharp, Making Europe Unconquerable: The Potential of Civilian-based Deterrence and Defense, Cambridge, Mass. : Ballinger, 1985; Gene Sharp with the assistance of Bruce Jenkins, Civilian-Based Defense: A Post-Military Weapons System, Princeton: Princeton University Press, 1990. My own perspectives are found in Brian Martin, Social Defence, Social Change, London: Freedom Press, 1993. (2) Robert J. Burrowes, The Strategy of Nonviolence Defense: A Gandhian Approach, Albany, NY: State University of New York Press, 1996. (3) Boserup and Mack, op. cit. EDITOR’S NOTE: Brian Martin is professor of social sciences at the University of Wollongong, Australia and vice president of Whistleblowers Australia. He is the author of 14 books and hundreds of articles on dissent, nonviolence, scientific controversies, democracy, and other topics, including these titles: Social Defence, Social Change, London: Freedom Press, 1993; Technology for Nonviolent Struggle, London: War Resisters’ International, 2001. His website contains links to his articles on nonviolence, biographical information, et al; www.bmartin.cc/index.html. Versions of this review were published in Gandhi Marg, May/June 1997; and in Nonviolence Today, July/August, 1997, as shared under a Creative Commons Attribution 4.0 International License. An archive of back issues of Nonviolence Today can also be found at: dkeenan.com/NvT/index.html.